Shhh! Be quiet! Or you might get eaten by one of those creatures in the woods. It's almost time for A Quiet Place to arrive on home video. The horror hit debuted on Digital last month, and finally makes it's way to Blu-ray and DVD this week. To celebrate, we have a crazy ASMR video that will send shivers down your spine. 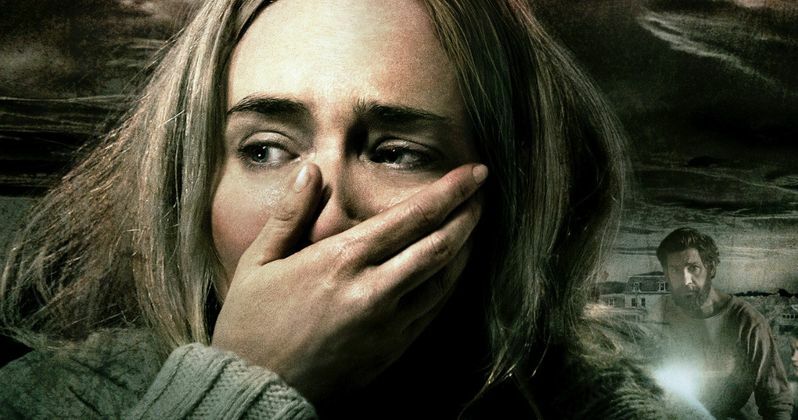 This special video was created by the supervising sound editors of A Quiet Place, Ethan Van der Ryn and Erik Aadahl. Though a number of unique techniques, they engage in some ASMR, which stands for Autonomous sensory meridian response. Basically, they make certain sounds with various objects, and it's supposed to trigger various different feelings inside your mind and body. Some people even find ASMR to be arousing. ASMR videos are a huge Internet trend. Influencers record soothing noises like whispers, soft fabrics, and fingers running through sand. Our duo here are playing with sounds inspired by the film to create this A Quiet Place-themed ASMR video to help home viewers recover after watching the film. The 4K Ultra HD and Blu-ray Combo Packs take viewers deeper into A Quiet Place with behind-the-scenes footage exploring the exceptionally unique sound design, the riveting visual effects, and how the cast and crew created the movie's distinctive atmosphere both on set and on film. The 4K Ultra HD and Blu-ray Discs also boast a Dolby Atmos soundtrack remixed specifically for the home to place and move audio anywhere in the room, including overhead, and the 4K Ultra HD disc features Dolby Vision™ high dynamic range (HDR), which delivers greater brightness and contrast, as well as a fuller palette of rich colors. So, after you sit down and watch A Quiet Place on home video for a second or third time, or maybe it's your first, you'll definitely want to dive into this soothing ASMR video. It will help calm your nerves and allow you to relax after that thrilling climax. A Quiet Place arrives on Blu-ray and DVD from Paramount Home Video.